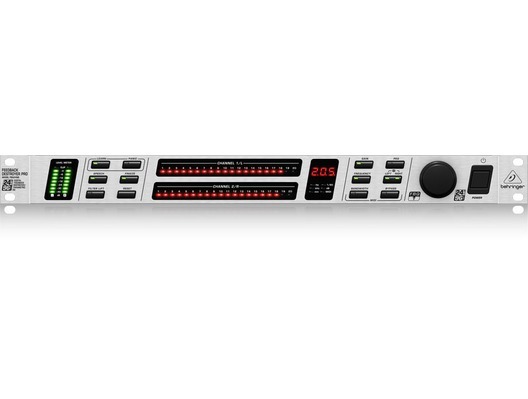 The Behringer FBQ2496 Feedback Destroyer Pro is a rack-mountable solution for fast and effective feedback suppression. The Feedback Destroyer PRO is the fastest feedback suppressor on the market (less than 0.2 seconds) and the only one to offer a 96 kHz sampling rate. This audio solution is the quick, easy way to protect yourself and your audience from feedback. FBQ2496's Auto mode continuously monitors the mix, resetting programmed filters automatically, while the Manual Mode allows individual programming of up to 40 fully-parametric filters with frequency, bandwidth and gain adjustment. Open MIDI architecture makes future firmware updates and flexible communication with digital equipment exceedingly simple. With the FBQ2496's various modes, you can master just about any live sound situation or use the unit as a creative sound-shaping tool. A single FBQ2496 can protect you from feedback in both your mono PA mains and a monitor mix. The FBQ2496 is more than just handy - it's affordable! Your ears - and your audience will thank you! Here we have the Behringer FBQ2496 Professional Feedback Destroyer in brand new condition and in B-Stock. The B-Stock versions would have been on display at a training evening or trade exhibition only and will come boxed 'as new' with the power lead, manual and a 1-year warranty.